Sweets for the Sweet - Family Times is an award-winning magazine with staff-written news, feature stories and artwork that inform and inspire Central New York parents and their children. Being original on Valentine’s Day is not particularly easy. Millions of cards are exchanged and billions of dollars are spent on flowers each Feb. 14. So, forget construction paper and overpriced petals. Instead, get the kids in the kitchen to make sweet treats: chocolate-covered strawberries! Choose a package of fresh strawberries. Soft, green leaves and shiny red skin indicate fruit that has recently been picked. Keep in mind the biggest berries may not necessarily be the juiciest. Avoid overripe berries that will lose their shape and become mushy when handled. Pick out about a pound or so of chocolate. Pre-packaged morsels and chunks from the baking section of the grocery store can even include flavors like caramel, peanut butter and butterscotch. I prefer chocolate mixtures that can be purchased in craft stores and Walmart. These chocolate wafers (dark, milk, white) can also be found in the bulk section of grocery stores and can be measured in the amount desired. Choose at least two different flavors. Plain chocolate-covered strawberries are tasty and easy enough for small children to help make. To get into designer mode, gather coconut flakes, crushed cookies or pretzels, mini M&Ms, nuts, and sprinkles of all kinds. The choices are endless. Presentation is just as important as taste. Purchase plastic heart-shaped plates and white paper doilies. For those who wish to give a bouquet of “roses,” buy lollipop sticks. Since melted chocolate can harden at room temperature, it’s best to have all your items out and ready to go before beginning. The single most important rule is to not let the chocolate seize or get scorched. Both result in thick lumps that cannot be fixed. Seizing is when chocolate is mixed with an incompatible ingredient. Tempering pure chocolate is tricky, so I suggest sticking with a chocolate mixture, such as Merckens wafers, which contains emulsifiers and milk solids that can handle extracts and colorings that are probably already in your pantry. Pure chocolate must use only oil-based (not water-based) ingredients, which are more readily found in craft stores. These flavorings are very concentrated, so only a drop or two is needed. To avoid scorching, the chocolate cannot burn. It can be melted in the microwave or on the stove in a double boiler. (A pot of water under a pot of chocolate, which warms indirectly, reduces the chance of the candy getting too hot.) My son and I use the microwave because it’s the easiest and safest way. As long as the morsels are in a microwavable bowl that is taken out often and stirred, nothing should burn. Don’t forget the pot holders! Start off with about a cup of chocolates in the microwave for 30 to 40 seconds. They will melt on the bottom first so I usually check to see if they’ve softened, then put the dish back in for another 30 seconds. Once you’re able to actually stir, cut the length in the microwave to about 20 seconds at a time. Add another half-cup of chocolate if needed and repeat. Don’t try to get all the pieces to melt on their own. When the majority is smooth and glossy, stir so the warm temperatures melt the rest. Do this for the other flavors. Food coloring or flavors can now be added. Coating strawberries is a bit of trial and error. It’s important to gently pull up the leaves so they don’t get covered, but don’t hold by the leaves because the fruit gets heavy and the greens will rip off. I found it helpful to do a berry or two, so my son could see what I wanted him to do. Holding the strawberry at the top will allow the most control—and besides, the whole fruit doesn’t necessarily need to be covered. Dip the strawberry into the melted chocolate by using a front, back, side, side motion. It’s best to do it fairly quickly to avoid chocolate buildup. I try to let it drip or wipe the bottom across the edge of the bowl. Hold the berry over another small bowl and sprinkle toppings immediately, if desired. Allow to set on the parchment paper. If the bowl of chocolate starts to get lumpy or loses its gloss, simply pop it back in the microwave for a few seconds to re-melt. For any dipping that doesn’t come out just right, my professional suggestion is to eat the evidence and start over with another berry. Once you find your groove, it’s fun to get creative. To try a fancy swirl, dip with the primary chocolate, drizzle the secondary and use a toothpick to make designs. 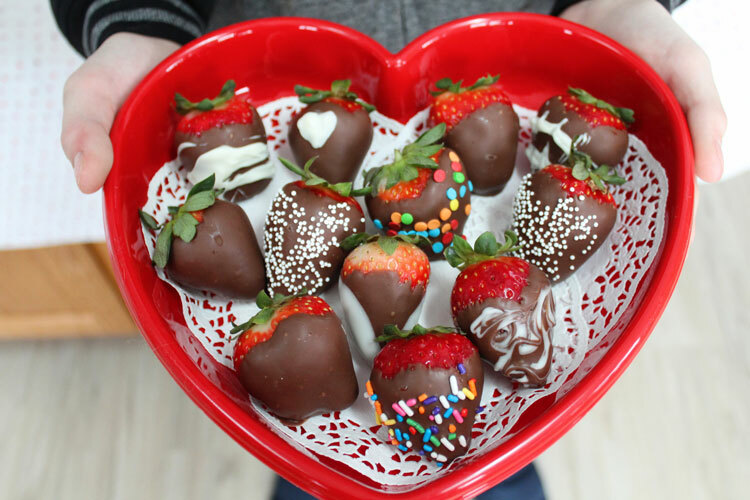 Make tiny chocolate hearts onto the wax paper and, when set, “glue” them onto the strawberry using a small bit of chocolate. Adding a different flavor or color chocolate to an already dipped strawberry isn’t difficult, just allow the first chocolate to set. It will be dull instead of shiny, and firm when picked up. Drizzling in diagonal lines looks professional and is a fast way to decorate. No need to wrap this present: Artfully arrange berries on a pretty plate and top with a bow. To make “roses,” carefully poke a lollipop stick through the stem. Wrap them in tissue paper inside a box with tulle, baby’s breath or ferns. For a display, poke the sticks into floral Styrofoam inside a stout vase, and add ribbons. I used a potato inside a decorative Chinese takeout box with tissue paper. Eat the same day for the best flavor and freshness. Creating this edible gift is fun and easy, yet it still looks elegant. It’s also less expensive than ordering anywhere. And since it’s homemade, it’s made with love.